Japan’s oldest spirit was once reserved for royalty, and now it’s Okinawa’s most loved beverage—you might even find it in your cheese. Painted in a musky shade of rose and decorated with bohemian knick-knacks, Bambi, a tiny sliver of a bar, could be in Paris; except when we sit down, we’re given tall glasses of awamori mixed with ice-cold water before we’ve uttered a word. “Mensore!” the bar’s patrons cheer, when they realise we’re from out of town. There’s little doubt now that I’m in Okinawa—mensore means ‘welcome' in the Okinawan dialect, and awamori is the prefecture’s appellation-controlled spirit. No alcohol made outside of Okinawa—in fact, none outside the 47 pre-approved distilleries in the region—can be called awamori. “Awa means foam, and mori means an accumulation,” says Hayashi Nakazato, director of Kamimura Shuzo, an awamori distillery founded in 1882. He explains that before the invention of alcohol meters, distillers used to assess the level of alcohol in awamori by pouring it from a small spout at a considerable height, and watch how many bubbles formed in the cup—the more bubbles, the higher the alcohol content. This liquor is often confused with shochu, another Japanese alcohol that is distilled, but several qualities set awamori apart, which has been immortalised in its appellation of origin, a certification given by the World Trade Organisation. The appellation states that awamori must be made in Okinawa prefecture, use rice as its only base material, and black koji (mould) as its fermentation starter (as opposed to white or yellow koji common in sake-making). In Okinawa today, awamori is so popular it’s often just called sake, or shima, meaning island. Okinawans are proud of their differences from mainland Japan, which is understandable, as they weren’t officially a part of Japan until the late 1800s. “Okinawa has a long and close history with the rest of Asia,” says Nakazato. From 1429 to 1879, the Okinawan archipelago was under the rule of the Ryukyu Kingdom, a largely independent monarchy that traded extensively with China and Southeast Asia, which explains why till this day, awamori is made with the medium grain indica, or Thai rice, rather than the short grain japonica, and is said to have been inspired by a Thai liquor made from glutinous rice called lao khao. It is believed to be the first distilled spirit in the archipelago that we now know as Japan, and was originally for the exclusive consumption of those in the royal palace. “The first awamori distilleries were established around Shuri Castle,” says Nakazato, referring to the palace of the Ryukyu Kingdom, “the emperor ordered it to entertain, and it was important in politics and diplomacy”. To make awamori, rice is first washed and steamed “to the point where it’s just a little firmer than what we’re used to eating, because the koji seems to like that,” says Tomonori Taira, a quality controller at Ishikawa Shuzo, a distillery in Nishihara City, next to Naha, Okinawa’s capital. It is then inoculated with black koji, then mixed with water and left to ferment – the length of time is up to the distiller – up to around three weeks. The fermented alcohol is then distilled in what the western spirits world would consider a pot still. A single batch each time, yielding an alcohol that is full of flavour and texture, but at this point, is usually around 70% alcohol. It’s therefore diluted, or “cut”, with water. Then, it’s up to the distillery to decide whether they want to age the awamori – as with most alcoholic beverages, the more it’s aged, the more expensive it gets. Traditionally, awamori is aged in ceramic pots, often made with clay found within Okinawa, although stainless steel and even ex-bourbon casks are now proving popular. “Ageing was popular because the Ryukyu Kingdom didn’t have to worry about cashflow, they simply wanted the highest quality. It’s said that some were aged for over a hundred years,” says Nakazato. 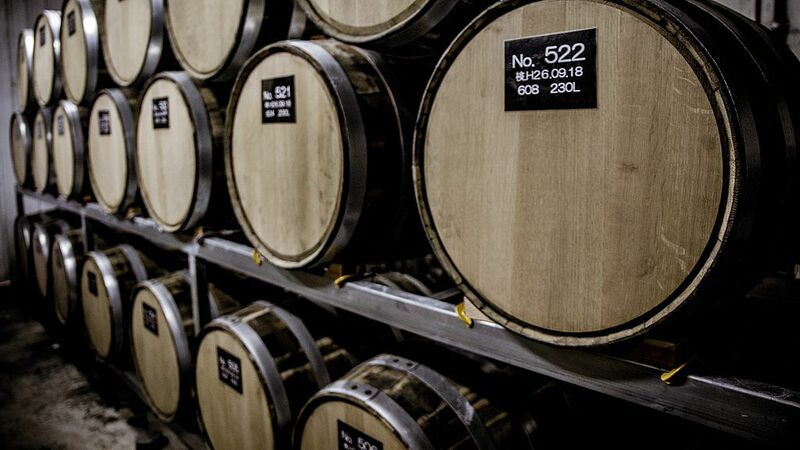 Ceramic pot ageing will often lead to mineral flavours, while stainless steel ranges from crisp and clean to savoury, and wooden casks will mostly feature sweet, vanilla notes. Awamori that is aged for over three years can legally be labelled as kusu, or "old liquor’. Although the most sought after awamori is often aged, it’s not just a drink for connoisseurs. After Okinawa was united with mainland Japan, awamori eventually became accessible to all, and no neighbourhood izakaya in Okinawa would be complete without it. In many restaurants, especially where Okinawa soba is served, koreguru, chillies soaked in awamori, is an essential condiment. A classic local appetiser, tofuyo, or fermented tofu, is made with awamori and koji, a starter mould. It was adapted from the Chinese fuyu, which is said to have been brought over from Fujian in the eighteenth century. Although much lower in salt than its Chinese cousin, tofuyo is still extremely intense in flavour, and is often eaten like a soft cheese, spread thinly on crackers. In an inconspicuous shopfront next to a suburban supermarket in the city of Nanjo, in Okinawa island’s south, English expat John Davis sells his take on tofuyo – cheese-yo. The Cheese Guy, as he and his business are called, sells a range of cheeses made locally using milk from a nearby dairy farm. Davis, who has lived in Japan for over 40 years and retired to Okinawa, used to satiate any cheese cravings with tofuyo, so when he started making cheese, he decided to make a cheese version of it. However, his experiments with Okinawa’s beloved beverage didn’t stop there. Working with Kamimura Shuzo, he decided to use black koji, the fungus unique to awamori-making, to create a cheese. It took around a year of recipe testing to produce the Ryukyu Crown, a semi-hard, almost fruity cheese with a bright acidity. Another product made in collaboration with Kamimura is his smoked cheese, smoked with the old wood casks used for Danryu, Kamimura’s award-winning barrel-aged awamori. Okinawans are known for their longevity, and it would seem that this applies to these ex-Jack Daniels casks too.